I’ve recently been reading the second book in the Space Triology of C.S. Lewis, Perelandra. The primary gist of the book is that Ransom, the main character, has travelled to the planet Venus (or Perelandra). And his old ‘nemesis’, Weston, has also found his way to the planet. Perelandra is in a ‘pre-Fall’ state, meaning that sin, and all its consequences, have not yet hit this planet. Weston’s role is that of the tempter, specifically trying to allure the only lady of Perelandra into disobeying Maledil (God). Whereas the first temptation of Adam and Eve was centred around not eating fruit from the tree of the knowledge of good and evil, the first couple of Perelandra have been commanded not to live on the Fixed Island, but rather stay on the islands that float along on the sea. As, with the temptation of Adam and Eve, there is no ‘reason’ given for why the Perelandrians cannot live on the Fixed Island. Rather, this is simply an unexplained command of Maledil. No specific explanation is given, but the loving parent is there to protect, guard and raise the child in things that are right. The desire of the child might not be specifically evil in and of itself, but the parent senses that the object of desire for the child should be withheld for the moment (or forever). Of course, we can think of abuses from parents in this situation. But I’m not taking time to address that here because I know our Father is loving and has our best in mind. I can’t explain it all, but I rest securely in that fact. I like this as well. But I’m more drawn into the words of C.S. Lewis about tasting the joy of obeying our Father simply because our Father asked us, since He does know what is best for us. I thought that, whereas that early command to not eat of the fruit of that one specific tree (as they could eat from any other tree) can baffle us at times, Lewis’ words captured the heart of the early command of Genesis. Even if I don’t always understand what God is asking of me, I want to get on and obey as a loving son. I see a smiling Father in the midst of such a response. This entry was tagged Adam and Eve, books, C.S. Lewis, devotional, fiction books, Genesis, God, Perelandra. Bookmark the permalink. Interesting read. I always thought the Tree was no more special than any other tree, but God put a restriction on there in order to “test” us. But isn’t it human nature to be inclined to test our boundaries. It’s like telling someone, you can do anything you want in this room, just don’t press the red button, I’m sure it incite some serious curiosity, and perhaps they’ll give in to the temptation just to see for themselves what that button is all about. Hi Glenn. Thanks for stopping by and commenting. You asked if it is in human nature to be inclined to test boundaries. Maybe, and especially in our fallen state. But I wonder if that is fully true with our pre-fallen parents, Adam & Eve. C.S. Lewis’s thoughts in Perelandra regarding all of this is quite interesting. Maybe you could check it out if you ever have the opportunity. It is amazing how Lewis describes so vividly something that nobody has experience of — what is to live in a non-fallen (OK, ‘pre-Fall’) state of mind. 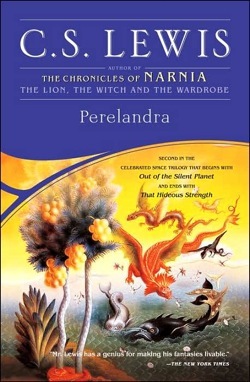 (Similarly, in “Out of the Silent Planet”, but in Perelandra it is revealed somehow much more personal.) This is what I like most in this book. It shows that godliness could not be so fragile as we know from our own experience. It could be really vital, so that sin would have to find its way by exhausting it. By the way, it is strange indeed that for our “why”-questions we refuse to accept answers like “because I want you to do so”. It would be a perfectly valid and reasonable answer only if we allow God to be part of our life. But we much easier accept arguments in which God is not present, like “because this is good for you”. Only then we would say, “that makes sense”. But shouldn’t the will of somebody we love and respect to make sense for us as well? Logically – yes, practically – not. Eu gostei deste livro. Eu estou aguardando para ler o terceiro livro da trilgia espacial de CS Lewis. Ainda não tem disponivel no Brasil.